and a little bit of color here and there. Every once in a while an Indian (read American Indian) will give a friend or family member a nickname. Sometimes these names are given just for fun, other times they are given to help that person be humble. “Dances With Wolves” comes to mind. I actually know some of my aunts and uncles by their nicknames: Ishky, Bunny, and Boogens are three. I told my wife that I finally figured out what her Indian nickname was. “Well, what is it?”, she asked. “Too Many Pillows”, I said. She laughed… because she knew it was true. I managed to find out where I could write to Bob Hope at the time and sent him a copy, hoping that he might have some information about it. I received this letter from him along with my returned photo. Mr. Hope couldn’t provide me with any new information except to suggest it may have been taken in a studio. (I was thinking Cali-for-nii-aa) but I was pleased nonetheless to have received a personal letter back along with his autograph! During that period, I pretty much dedicated myself to looking up as many possible Ancestor references for myself and friends who were interested. I probably looked at a thousand possible articles and was rewarded with a score or more, which I “Clipped” and then downloaded. This was one of them. Yep, same top hat, same sport coat, same two people. BINGO!!! Mystery solved. 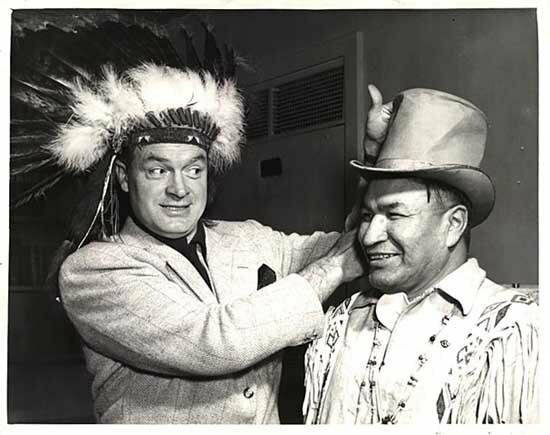 “Forever a gagster, Bob Hope invaded Minneapolis Monday. He put on a two-hour stage show in Minneapolis Auditorium. Sang a duet with Mayor Eric G. Hoyer, said nasty things about Bing Crosby, and was made an honorary Indian. Most of the shenanigans took place in Nicollet Hotel, where, among other things, the ski-nosed comedian attended a dinner put on by the Theadore Peterson American Legion Post. As a side note, I like Hope’s irony here. That’s the first time I’ve heard of an Indian being made an honorary Paleface! All kidding aside, for you genealogy buffs out there, Try the Newspaper.com free Trial. It was worth it! (And, they actually made cancelling the trial easy!) All irony aside, I will pay for a subscription–which I can get for just one month if I want–should I need to research other ancestors in the future. So we turn off into the dump grounds, where six large dumpsters are lined up on an asphalt pad inside a ten foot high chain link fence. Our headlights illuminate almost everything–to a height of about six feet. A bear saunters out from between the dumpsters–wary, as any wild animal is on an Indian reservation. He is huge for a bear, at least a good six hundred pounds. He walks slowly away and out of the compound with a full white garbage bag clutched in his mouth. hoping for a morsel leftover from her master. Another bear rises from scrounging within one of the far dumpsters. His form towers three feet above its five foot high walls. Strangely enough, we do not see each bear. the light of their spirit within them. The air is cool through the open bedroom window. Their song fades in and out. squabbling for a chance at some cast off walleye. while cirrus clouds lazily drift high in the sky. Hear their cadence and accent as we commune. unless you can be a Littlecreek.